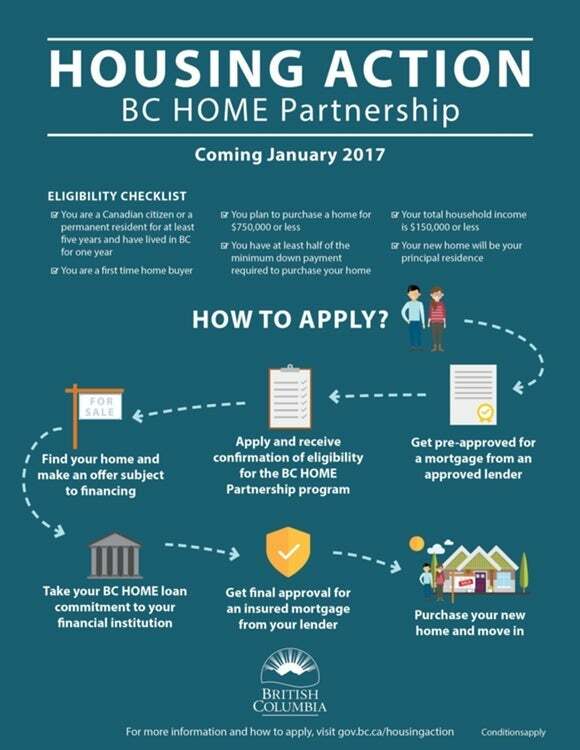 Premier Christy Clark announced December 15 a new government-backed loan program, which will lend homebuyers in BC up to $37,500 towards a down payment for their first home. The B.C. HOME Partnership program will match the amount first-time homebuyers have saved towards a down payment, up to a maximum of $37,500, and no more than five per cent of the home’s total value. The loan only applies to homes with a total purchase price of $750,000 and under, and only for qualified "stress-tested" buyers with insured high-ratio mortgages (with a down payment of less than 20 per cent). Have saved a down payment amount at least equal to the loan amount for which they are applying from government. Have been a Canadian citizen or permanent resident for at least five years. Have lived in B.C. for at least one year prior to the sale. Be a first-time buyer who has not owned an interest in any residential property anywhere in the world at any time. The home must have a purchase price of less than $750,000. The buyer must already be able to qualify for an insured high-ratio first mortgage for at least 80 per cent of the purchase price. The combined gross household income of all people on title must not be more than $150,000. At the press conference this morning, Clark said the BC government established the loan to help homebuyers who already qualify for an insured high-ratio mortgage but struggle to afford the initial down payment.“ I firmly believe that the dream of homeownership must remain within reach of the middle class in British Columbia,” Clark said. People need a partner in scraping together that down payment, and the B.C. government wants to be that partner,” Clark added. The funds for this program are sourced from the province’s property purchase taxation, which includes the foreign buyer tax, said Clark. She doesn’t believe the loan program will affect home prices.“ Our analysis tells us that it won’t because everybody who is going to be eligible for this program will have to have been accepted for a mortgage already,” said Clark.The program will last three years and Clark said there’s no cap on the amount of money available or the number of applications they can approve. Online applications open January 16, 2017. UBC Sauder School of Business economist Tom Davidoff called the program "terrible policy." He said there is too much demand chasing too little supply, and that providing more financial flexibility to people will keep both demand and prices high. "People are going to bid exactly what they are willing to pay. Now you tell them you are going to give them more money … and it encourages them to bid more for the property," said Davidoff. " So to the extent you have multiple first-time home buyers bidding on the property, all this does is hand money to the property owner." In an interview with On The Coast host Stephen Quinn, B.C. Minister of Housing Rich Coleman says he doesn't often agree with Davidoff, and on this point, he's "completely wrong." He says Davidoff and others are focusing too much on the Lower Mainland market. In places like Penticton, Clinton or Prince George, it will help the market and buyers, Coleman said. "You have to understand the total market, not just micro pieces," he said. "I have two children who both started out with condos and now own single-family homes a decade or so later. They have to start somewhere. "This is an opportunity to have people start somewhere and it also frees up other pieces of the market at the same time." Coleman says applicant screening will prevent people from taking on too much debt from these loans. "They have to be able to afford the mortgage. … We're helping with the down payment."